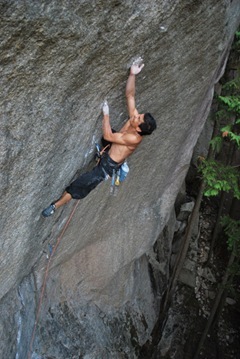 40-year-old Yuji Hirayama, the legendary all around climber from Japan, made a trip to British Columbia late this summer. Not surprisingly he left with a couple of notable sends that included a repeat of the Squamish trad climbing testpiece Cobra Crack (5.14) and an onsight of Dinosaur Highway (5.14a) at Horne Lake. It’s incredible. These guys can boulder hard, have great endurance. I think they can imagine doing 9a on-sight. If I were in their position… I’d seriously think about that. What is important though is that they continue to push their limits as long as they enjoy themselves. What is also important is that we sometimes need to focus less on the grade and more on the actual route – don’t ever forget that there are so many great climbs that aren’t necessarily 9a! Read the rest of the interesting interview here. Great to see another repeat of Cobra. That’s one line that is on my todo list. Yuji is one of the greaters climbers and characters our sport has seen. Always humble and tons of class. I guess I could have said the he was SUPERIOR, would that have been better? Seriously though, it’s hard to think of many other .14a onsights in North America which really is a testament to his amazing skill. As an Asian-American climber, it’s welcoming to see that other Asian climbers are getting mention, outside of Asian, from time to time.